John Wayne said: “Courage is being scared to death and saddling up anyway”. Times have changed. John Wayne’s Wild West has disappeared. The warfare once thought so glorious (and which Aristotle felt was the only place to find true courage) now depends less on the physical courage of the individual warrior and more on technology, information, and weaponry launched from a safe distance. To push the envelope was safe back in prior centuries, but in the 21st century we have keyboards – hitting one button can have critical consequences. For example; Chernobyl, Nic Leeson at aged 29 sunk Barings Bank through technology, plagiarism, 9/11, computer bugs, viruses, computer hackers. If the need for physical courage in everyday life is dwindling, the opposite is happening for moral courage. 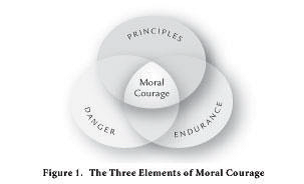 Moral Courage is not about facing physical challenges that could harm the body. It’s about facing mental challenges that could harm one’s reputation, emotional well-being, self-esteem, or other characteristics. These challenges, as the term implies, are deeply connected with our moral sense-our core moral values. Moral Courage is a courage that operates within the realm of concern for good and bad, right and wrong. Courage is not quite like the other values. Rather than being the next pearl on a string with the values of honesty, respect, responsibility, fairness, and compassion, moral courage is something that enables the others to be effective. Aristotle defined moral virtue as an “intermediate” between a defect and an excess. Courage, he said, lay balanced between the defect of cowardice and the excess of rashness. Put another way, one can think of courage as flanked by two alternatives: its opposite, the cowering timidity that dares not act, and its counterfeit, the bravura and foolhardiness that looks a bit like courage but isn’t. The courage that is truly moral, then, has built into it a moderating restraint. If it falls backwards, it becomes its own negative. If it lapses into excess, it turns into a caricature of itself. Why should moral courage matter so much to us? In part because we see so many examples of its lack, in corporate settings and legal proceedings, in politics and sports and entertainment, in personal and social relationships. But there’s another, deeper reason. If courage is indeed one of the core virtues of humanity we need to find ways to express it, support it, and teach it. The proving of one’s own courage, after all, has long been a rite of passage from youth to adulthood. When young men went to war and pioneers took to the wilderness, they were carving out new opportunities for themselves. But they were also testing their mettle beyond the comfortable regulation of civilization. Because whistleblowers have the moral courage to demonstrate the willingness to test this comfortable regulation they directly support the need to shape social norms, rather than merely being subject to them. In the absence of moral or ethical business behaviour, there is a need for whistleblowing. The act of whistleblowing is moral courage in action. Moral courage creates better cultures. The moral climate of any organization or group is larger than that of the individual, is created hour by hour through the multitudes of choices and behaviours of its members.